Oh, dear. Over a week since I blogged last. I’ve been quite busy with things – preparation for the move, for instance, is gaining momentum. We took photos for our passports the other day (they’re ridiculously expensive for what they are). We’ve been arranging appointments and attending briefings…outprocessing for another country is really complicated, and that’s not even counting shipping our things. We haven’t started that yet. Woohoo! 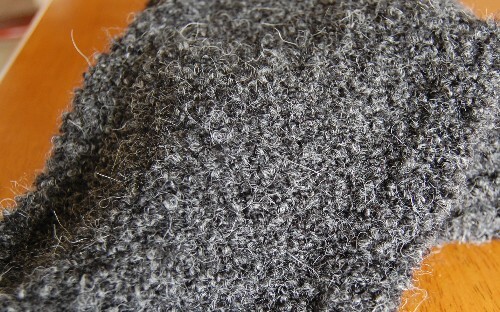 But I do have something finished to show off: I finished Greg’s scarf. I also got a haircut that I think is quite saucy. 😉 It was not easy to get a picture where both the scarf and the haircut looked good. I’d like to introduce you to my photographer, Table. He’s a little wooden. Although it’s very simple, I like what I decided to do for the scarf. 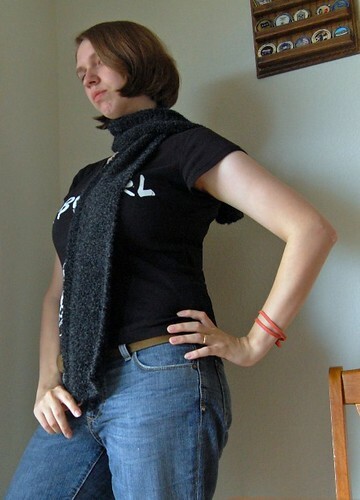 If you will recall, I worked it in mostly stockinette to show off the yarn, with a garter stitch border to reduce curling. Anyway, if you want the ‘pattern’ for this scarf, here it is. Cast on 24 sts. Knit 3 rows. On next and all wrong side rows k3, p18, k3. On all right side rows knit across. Continue until desired length is reached or 4 yds of yarn remain. Knit 3 rows, bind off. Weave in ends, wash and block out. See? Simple. It’s nice to have a little bit of simplicity while other things are getting more and more complicated. I have a lot more to blog about, but that’s all I can do today. Perhaps I can get caught up tomorrow. Best of luck with your move. I really like the haircut, it looks cute on you! How hard was it getting the boys’ passports? I got one for Chunky about two years ago and trying to get him to sit still so the picture came out just right was a pain in the bootie! Oooo, I love your model pose. It really shows off the awesomeness of the scarf. Love the hair cut and pose. But especially love the patters. Thanks for a great job. Can’t wait to try knitting these. They look so good.